Normally, bursa are flat and contain very little fluid. An injured bursa however, is swollen with fluid and not so flat anymore. Deep Bursae separate bare areas of bone from overlapping muscles. Superficial Bursae separate bare areas of bone from skin or tendons. Deep Bursae develop in the womb. Superficial Bursae develop within months to several years after birth. On occasion, bacteria can invade a bursa and cause an infection. An infected bursa is known as septic bursitis and can be life-threatening if left untreated. So make sure you see a physician! Septic bursitis is most common in knee joints and elbow joints as the bursae in these locations are close to the skin and most susceptible to bacterial invasion. It is not uncommon for bursitis to be misdiagnosed as arthritis. Bursitis is best avoided by staying in shape, taking frequent breaks from repetitive or laborious tasks and cushioning joints if on them for long periods (ie. kneepads for gardening). A Bursa can swell to a surprisingly large size. In cases of heavy swelling, your physician may choose to drain fluid from the swollen bursa. If a lump is present in chronic bursitis cases, excision may be required. Clergyman's Knee comes from a more upright posture when kneeling in comparison to Housemaid's Knee. Patients suffering from gout or syphilis can be at higher risk of contracting Clergyman's Knee. The pes anserine bursa is found on the inside of the knee joint. This specific bursa is positioned between the tibia (lower leg shinbone) and 3 tendons that connect hamstring muscles to the tibia. Hamstring muscles are powerful and are capable of exerting tremendous stress and friction on the pes anserine bursa. You have sharp pain on the inside of your knee a couple inches below your knee joint. exercising or even climbing a set of stairs. Your sleep has been interrupted rolling over causes point pressure and more pain in the knee. You have pain when touching the inside part of your lower leg below the knee. You have weakness in your knee and leg from the pain. The inside of your knee may be swollen. If any of those statements are true for you or you're suffering from on-going pain on the inside of your knee then you might have an injury called "pes anserine or goosefoot" bursitis. This fairly rare form of knee bursitis can be caused by hamstring tightness and repetitive knee movements. Repetitive lower leg movements are sometimes found in specific jobs or in sports related activities such as running and/or excessive climbing. What is Goosefoot (Pes Anserine) Bursitis? Pes anserine bursitis is a painful, inflammatory condition affecting the tendons between your shinbone and the hamstring tendons at the inside of your knee. The pes anserinus is the area where the tendons of 3 muscles (sartorius, gracilis, and semitendinosus) come together. The three tendons merge together in the skin of the bone on the inside surface of the shinbone. These three muscles are the dominant knee flexors; they influence the rotation of the tibia and protect the knee against rotary stress. The pes anserinus is the area where the tendons of 3 hamstring muscles (sartorius, gracilis, and semitendinosus) come together. The three tendons merge together on the inside surface of the shinbone. These three muscles are the dominant knee flexors that function to allow movement of the leg towards the body and control rotation of the tibia, protecting the knee against stress when it is turned. The pes anserine bursa lies beneath these tendons close to the shinbone, providing cushioning between the tendons and the tibia. 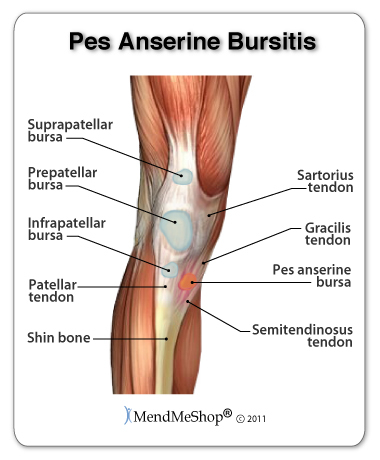 Pes anserine bursitis occurs when the pes anserine bursa sac inside the knee becomes irritated and inflamed. A bursa is a sac of synovial fluid, rich in protein and collagen. These fluid-filled sacs are located in areas where 2 surfaces in your body, most often where a bone and tendon or a bone and muscle, rub together during movement. Bursae play an important role in leading a healthy, active life as they allow your joints to move smoothly and painlessly. If there is too much pressure or friction on a bursa, excess fluid can build up in the sac and/or the the lining of the sac can thicken, causing inflammation. The excess friction can happen all at once (acute), or over a long period of time - typically due to repetitive movements (RSI). When the pes anserine bursa becomes inflamed, moving your knee becomes very painful and more difficult as severity increases. Once a bursa is injured, fluid and/or blood is allowed to enter into the bursa and inflammation will increase over time. Once this happens, the bursa sac walls may thicken and form scar tissue or calcium may collect in the bursa. If pes anserine bursitis was incurred due to the nature of your work, you will have very little chance of getting rid of this condition unless you change or stop the work that caused it until it is completely healed. What is the difference Bursitis and Tendonitis? Each joint in the body has one or more bursae (bursae is the plural form of bursa). Bursae are flattened fluid-filled sacs that function as cushions between your bones and the muscles (deep bursae) or bones and tendons (superficial bursae). When the joint is over overused or overstressed, the bursa may become damaged with small micro-tears on the surface or become squeezed by tissue which has become tight. Tendons are tough cords of tissue that connect muscles to bones. Overusing or over-stressing any area of the body will often damage tendon tissue which can cause tears both large or small. Tendinitis is when the tendon gets overstressed and microtears in the tendon form, weakening the tendon and often causing significant pain and inflammation. It is possible to have both bursitis and tendonitis as the same time in any joint in the body. Excess Stress on the Pes Anserine Bursa. Sports that require athletes to make frequent side-to-side or quick back and forth movements can put athletes at risk of pes anserine bursitis. This is due to the repetitive, sudden pressure applied to the bursa during these movements. Lack of exercise or activity allows muscles to become weak and your knees begin to lack the proper muscle support. This can cause excess load on the knee joints or may cause your weight to be unevenly distributed. Uneven distribution of weight will put extra stress on some areas compared to others leading to abnormal wear and tear on the stressed areas. In addition, if you are overweight, the knee joints have to work harder to carry a greater load causing more stress on the tendons, ligaments, muscles, bones, and bursae in the knees. The excess stress can lead to irritation and inflammation of any of the soft tissue over time, including the pes anserine bursa. A direct blow to the knee or the pes anserine bursa just below the knee during athletics or when falling on the knee can result in goosefoot bursitis. In such cases, blood may leak into the bursa causing irritation, inflammation, swelling and pain. If your work or exercise routine requires frequent climbing, running, jumping, or hiking you may be at higher risk of prepatellar bursitis. This risk increases if there is anything that many cause abnormal wear and tear within the joint. If the bursitis in your pes anserine bursa is septic, you will require antibiotics from your doctor to treat the infection. Warmth and redness in the area are signs of an infection as well as a fever. If you suspect your bursitis is septic, be sure to see a doctor immediately. If you suffer from osteoarthritis in your knees, as your knees experience wear and tear, there is a release of destructive enzymes which break down the cartilage to the point where the bones of the knee joint rub together and develop sclerosis (a hardening of tissue) as well as tiny fractures, cysts and bone spurs. The excess wear and tear can cause abnormal pressure on the bursa leading to irritation and inflammation. Pain, Tenderness and Swelling - If you suffer from bursitis in your pes anserine bursa you will feel pain or tenderness over your tibia, approximately 2-3 inches below the patella, or kneecap. The pain often felt down to the back and inside of the thigh. Pain becomes worse during exercise or when you are climbing stairs, but can also increase by simply bending and straightening your knee. Pain usually starts gradually and develops over a few days or even months. Swelling is usually evident over and around the bursa that is inflamed. This swelling may appear immediately following trauma, over a couple of hours, or up to 7-10 days after the incident. You may notice warmth and visible redness on your skin in the area as inflammation in the pes anserine bursa and along the tendons becomes more severe. Interrupted Sleep Patterns. Simply bending your knee or rolling over during sleep can cause pressure on the inflamed bursa, increasing your pain. The pain can range from mild to very sharp depending on the amount of inflammation in your knee. Many knee bursitis sufferers recommend placing a pillow between your knees/thighs while you sleep to reduce pain throughout the night. You may have limited range of motion and weakness in your leg and knee. The pain is often limiting as you stop performing motions that make the pain worse. If bursitis is left untreated the inflammation can increase, causing more pain, limiting movement even more. Eventually, weakness in the leg muscles and and tendons around the knee can set in. As you lose strength in your quadriceps, your legs may begin to give out during daily activities. It is important to treat pes anserine bursitis in the early stages to reduce the symptoms, minimize damage and maintain motion and strength in your knee. Eliminate any squatting, repetitive knee bending, crossing your legs, kneeling or any other activities that add pressure on your bursa. By treating your pes anserine bursitis (& often the accompanied tendinitis) in the early stages with conservative treatment methods, you are more likely to prevent long-term damage and chronic conditions from setting in. How Do I Diagnose Goosefoot Knee Bursitis? When you are experiencing knee pain, a visit to the doctor is always recommended, as there are many conditions that can cause knee pain such as a meniscus tear, an ACL sprain, patellar or quadriceps tendinitis, a fracture, and yes knee bursitis. Getting a proper diagnosis is important so you can treat your condition correctly. To begin with, your doctor will gather a medical history about you and your current condition and symptoms. He/she will ask about the amount pain you are having with your knee. How long you have had your symptoms and if you are have range of motion loss with your leg and knee. Details about what caused the pain in the knee, when it started, and whether or not you have ever had treatments for this or a similar condition in the past, are very helpful in assessing your injury. A physical examination will be performed to determine if you have any signs of knee bursitis or other knee injury. He/she will visually assess and palpate (feel) the bones and soft tissue in both your knees to evaluate any differences between the two of them. This will identify any abnormalities, such as swelling, bone deformities, atrophied muscles, redness and/or warmth on the skin. In many cases, the first sign that you have knee bursitis is swelling at the joint. Range of motion movements / tests will be done to see how much movement has been lost in your knee. Your knee might hurt from the doctor poking and prodding at it, but by doing this the doctor will better understand the source of your pain, the level of tenderness in and around your knee and how well your knee can move with this condition. Your doctor may also consider any previous knee injuries or joint stiffness that you may have had in the past. This will help the doctor to determine if you have a more complex injury in your knee and rule out any other foot injuries that may be present. If a soft tissue injury is suspected, an MRI may be undertaken to view where and how extensive the damage is. An x-ray may be recommended to rule out other possible causes of your symptoms. Possible causes of pain that an x-ray can identify include instability, abnormal bone shapes (bone spurs or bone cysts), wear and tear on the joints, avulsion fractures (when a fragment of bone tears away from the main bone along with the muscle, tendon, or ligament as a result of trauma), dislocations, arthritis, calcium deposits in the bursa or joint, and/or other problems. As the bursae in the knee are close to the surface of the skin, they are more susceptible to septic bursitis (caused by a cut or scrape) than most other bursae. Your doctor may aspirate (use a needle) to remove fluid from the bursa to check for possible staphylococcus epidermis (or staphylococcus aureus) bacterial infection. Your doctor will be able to determine whether there is an infection or not by drawing a small sample of the bursa fluid with a needle. If it is determined that your bursitis is septic, you will be prescribed antibiotics to get rid of the infection. Doctors and surgeons know that surgery will introduce more scar tissue into the tendons and ligaments in your knee - this is why they only recommend surgery as a last resort. This added scar tissue will be problematic, requiring physical therapy and conservative treatment options post-surgery. When it comes to pes anserine bursitis there's only a few surgical options for treatment - removal of the bursa sac, scraping of the bone(s) to allow more room for the new bursa to grow back. This is why surgery is almost always only performed on chronic bursitis cases that won't heal with conservative treatment methods. Relieving the pain of your sore knee and the symptoms of bursitis initially focuses on keeping the pressure off the bursa. If your pes anserine bursitis was caused due to the nature of your work, you really need to stop that type of work until the bursitis is gone. For non-infectious bursitis, the preliminary treatment will almost always start with conservative treatment options. Rest - This is important for initial healing because without proper rest you're at risk for increased pain, inflammation. If you are not resting your knee, your bursitis will probably worsen, possibly becoming chronic (persistent, long term). Over time, there is a high correlation of tendonitis and bursitis - it is possible that you will eventually contract tendinitis in the area if your bursitis persists. Avoid Activities that Caused Your Goosefoot Bursitis - While resting your knee it's also important to avoid all activities that may have caused your pes anserine bursitis, including any work related tasks that require kneeling or pressure on the knees. Continuing on with regular activities can increase the severity of bursitis, turning a mild to moderate case of injury into serious damage or leading to injuries in other areas due to overcompensation. Apply a Cold Compress or Ice Pack for Inflammation - Immediate cold therapy at the onset of your injury (or during flareups) will help you combat the pain and inflammation of bursitis and tendinitis. Immediate pain relief and reduced inflammation can also relieve some of the pressure that's being placed on soft tissue in the knee and keep the injury from worsening. Use a Knee T•Shellz Wrap® (Deep Tissue Therapy) Once Swelling is Down - After inflammation and/or swelling has been reduced, use your own blood flow to maximize your rehabilitation, decrease recovery time, and boost overall long-term healing. Deep Tissue Therapy is especially helpful in dealing with chronic tendon, muscle & bursitis injuries or on-going pain, stiffness or atrophy in a knee joint. Physical therapy and rehabilitative exercise under supervision of a physical therapist or doctor. The intent of this is to provide you with increased range of motion, pain relief and strengthening of the soft tissue surrounding the knee. Caution: aggressive physical therapy can be harmful, such as aggressive stretching or massage. When dealing with a knee that has very low range of motion, there is high risk of greater injury to weak, damaged muscles and tendons of the joint. Stage 1: If the bursitis was incurred recently or if there is still significant inflammation and pain - use a good quality cold pack and Arnica Pain Relief Cream. If the injury has been going on for awhile and there is no swelling, skip to Stage 2 below. Recommendation 1: If you are experiencing pain and swelling in the very early stages of the bursitis (first 48 to 72 hours), the first step in a conservative treatment protocol would be to focus on reducing the discomfort by applying a quality cold pack to the injured knee along with a high quality pain relief cream such as our Arnica Infusion Cream. Note: If you are suffering from a bursitis and/or tendinitis injury that has been going on for awhile, you may not need much cold treatment as inflammation may be minimal. Anytime you are experiencing significant pain, you will most likely find our Arnica Infusion Pain Relief Cream to be quite helpful. after any activity that stresses the knee in a moderate way. It is wise to quickly apply cold therapy to not only reduce the pain, but to also minimize tissue damage that may have occurred during the prior event. If you have a job that requires you to place some demands on your knee (ie. climbing stairs, kneeling, driving). If that is the case, use cold therapy immediately following work and if the opportunity allows - use it for 15 to 20 minutes during lunch or another break time. If you are in a post-operative situation where cold compression therapy would be utilized heavily for at least the first few weeks following the procedure. Similarly, if you are scheduled for upcoming knee surgery, then your doctor or surgeon might recommend undertaking cold therapy before the surgery. Having a Cold Compress or Ice Pack available at home to use if and when the need arises is helpful. Many of you already do so. However, too many people over-focus on cold therapy while ignoring the most critical aspect to healing - nourishing the injured tissues with a healthy supply of blood flow needed to repair and rebuild the injured tissues. Even though the concept is simple, improving blood flow to an inflamed bursa in the knee is not easy - there is already very little blood flow in a bursa to begin with!. Traditional methods require your joint to move to promote blood flow (exercise), but that same motion that promotes blood flow can at times lead to making your pain and condition worse - exacerbating your bursitis. Have you re-injured your knee by returning to work too quickly? How many times in the past have you aggravated your knee just trying to perform basic tasks around the home? Is your debilitated knee preventing you from work or activities you love to do? Most people we deal with tell us these scenarios have happened to them many times in the past. Perhaps it has already happened to you. Promoting blood flow within a muscle or soft tissue injury (such as bursitis) to help the body heal itself is a concept that has been utilized for centuries. This is where the focus has to be if you are seeking long-term improvement. Oxygen and nutrients, carried within the blood, are critical for the body to heal itself. Without proper blood flow, recovering from an injury or condition will be delayed...sometimes for a very long period of time. The real challenge is how do you promote blood flow to the knee injury site without causing further injury? This goal is further complicated by the fact the knee (and muscles controlling the knee joint) are involved in the majority of the physical movements we perform each day. Legs, hips and knees are interconnected and pain or mobility in these areas are often experienced in conjunction with one another. Many of the muscles attached in the knee area are connected to muscles in the hamstring and lower leg, which in turn connect to the pelvis and heel - basically the entire lower half of your body. An injury to one of these regions usually leads to straining in other areas, making an overall recovery hard to initiate. People tend to "chase the pain", meaning they only focus on treating an area that is actively painful, while not taking into account the fact they other areas of the body will be overcompensating...eventually leading to issues in those areas as well. In order to provide long lasting relief from your knee pain, you need to identify all the factors that are contributing to it. These factors can include muscle imbalances, short leg syndrome, herniated discs, trauma and tightness to surrounding muscle and soft tissue, etc. The list is certainly significant and it can be frustrating for people who may have no idea where to begin. When people think blood flow beyond exercise, they instantly think "heating pad". Unfortunately, many individuals make the mistake in believing that a simple heating pad or microwavable gel packs will provide the blood flow needed to heal injured soft tissue. Nothing could be further from the truth. To begin with, heating pads and warmed gel packs work on conduction. The heat they generate has to be forced through multiple layers of skin and fatty tissues. With each layer of skin the heat passes through, there is a corresponding energy loss because that heat is absorbing into each layer it passes through- the skin is an excellent insulator! Your body responds to this heat by increasing the blood flow near your skins surface (not in your injured tissue) to dissipate the heat and it does so quite effectively. By the time what little heat reaches below the skin, sub-dermal layer and fat layer into the targeted area (the dense, injured tissues), very little energy remains and this does not effectively enhance blood flow. With little blood flow reaching these injured tissues - healing just doesn't happen. The heating pad may feel comforting when on the body, but that is because the warmth is absorbing into the skin. Moist heat has been believed to be more effective at warming internal tissues versus dry heat, because it is believed that water transfers heat more quickly than through air. Clinical studies do not support that popular belief. When you are using a heating pad, all that you are really accomplishing is warming of the skin. The unintended consequence is that you draw blood flow AWAY from the targeted tissues (the injured ones deeper in the body) and direct the blood flow to the surface of the body. Warming the skin will not significantly contribute to healing of muscles, tendons, ligaments, cartilage, or any other tissues. So If A Heating Pad Is Not The Answer, What Is? In order to effectively stimulate blood circulation to dense tissue deep within the body, an energy based on an electromagnetic principle (diathermy) is needed. In essence, this is a conversion energy vs a conductive heat (like the heating pad example above - that is conductive heat). Electromagnetic energy waves are not conductive heat waves - they are a much longer wavelength and hence, penetrate deep into the body. They are very safe and very effective as research over decades has shown. The F.D.A recognizes this as fact. When these energy waves are emitted,they penetrate right through your skin and fat layers until they are absorbed by tissue high in protein. This means ligaments, muscles, cartilage, tendons and bone. Once they reach the targeted areas, they are absorbed and quickly converted into thermal energy... right at the location of the injury. This results in relaxation of the vessel walls. The vessels then gently expand, allowing for more nutrient rich blood flow along with extra oxygen and antibodies to reach the damaged tissues. Plus, the enhanced blood flow helps in flushing cell waste and fluid build-up from the injury site - further enhancing the ability of the body to heal. As mentioned above, standard heating pads and heated gel packs accomplish the exact opposite of your goals. They direct blood flow to the skin, not to the injured muscles and soft tissues you are trying to heal. Electromagnetic energy is a form of energy will easily penetrate through clothing, skin, and fatty tissues... directly into your injured muscles and soft tissues within the knee. After the energy absorbs into the knee, the metabolic response then kick starts the repair and rebuilding process. More blood now begins to flow effectively to the injured tissues deep within the body. The injured tissue needs the extra blood flow to heal as it is through the blood the body carries the oxygen, nutrients, and antibodies needed for proper and long-term healing. While the concept of electromagnetic energy is slowly catching on in North America, the truth is, it is a technology that has been utilized in other societies for decades. Over the past 30 years, researchers in Japan and China have completed extensive studies on the use of the modality and their findings have been impressive. In addition, success has been reported in studies from countries such as Sweden and Germany. Research is continuing and soon, much of North America will know what the Far East and Europe has known for a long time; electromagnetic energy provides a wide range of health benefits for those not only suffering from knee bursitis, but for many other ailments (tendinosis, bursitis, tendinitis, Tenosynovitis, tendinopathy, muscle tears, knee replacement post surgery, frozen shoulder, muscle spasms, achilles tear/strains, rotator injuries, sciatica, tennis elbow, etc.) as well. The best option we came across in our research to accomplish true healing of knee soft tissue injuries is the Knee T•Shellz Wrap®. Use of this device results in a dramatic increase in blood flow to injured soft tissue located deep within the body - all in a non-invasive manner. Have you seen what happens when you add water to a flower wilted from drought? In essence, your injured knee is much like a "wilted" flower; your body wants to heal its injury, but needs lots of nutrients to do it. Blood brings new life to your cells by delivering healing nutrients and oxygen that are vital to your tissue. In addition, the blood carries away toxins and cellular waste cleaning the area and healing it faster. Without a good supply of blood, your pes anserine bursitis simply won't heal properly. Using a T•Shellz Wrap® will not expose you to the risk of causing further harm to soft tissue like you can when using rigorous exercise. The Knee T•Shellz Wrap® accomplishes the goal of enhanced blood flow without the need for intensive exercise and as such reduces your risk of re-injury. The Knee T•Shellz Wrap® is based on the scientifically validated principle of Electromagnetic energy as we discussed previously. This form of treatment is safe and effective as shown in numerous studies which can be referenced through the National Library of Medicine. Professional athletes and those in the medical field have been users of the technology for decades - it really hasn't been until recently that companies like ours introduced the treatment devices to the home user. The healing energy from the T•Shellz Wrap® does not absorb into the skin - it absorbs directly into the damaged muscle and soft tissue (as a result, you will not feel the same level of heat on the skin versus a heating pad). The longer wavelength provides the electromagnetic energy wrap with the capability of penetrating deep into the body (well over two and a half inches). EM energy emitted from the T•Shellz Wrap® is absorbed by high protein tissue (muscle, tendon, ligament, cartilage) and is converted into Kinetic energy - much of this energy being released as heat. Overall, EM energy will warm soft tissues, improve blood circulation, and boost metabolism and enzyme activity. In stimulating localized blood flow to damaged soft tissue, you provide needed oxygen, nutrients, and antibodies to regenerate new, healthy collagen. In addition, you will experience a clearing of toxins and excess fluid build up from the injury site. Over the intermediate term, this helps to reduce incidents of swelling as trapped fluids will be whisked away - reducing pressure on blood vessels. Using the T-Shell Wrap is truly a unique experience. Within moments of applying a treatment to your injured knee, you can feel the healing sensation due to the increase in blood flow deep within the area. During a treatment, and for quite some time after you finish, the treated area will feel relaxed and less painful. It's a very soothing sensation and extremely effective. If you have injured muscles, bursae, tendons or ligaments in your knee joint, then the TShellz Wrap will provide the all-important deep tissue heat that will, in turn aid in boosting blood circulation where it is needed most. If you are dealing with conditions affecting your range of motion in your knee such as an ACL tear, muscle strain, tendonitis or even arthritis. If you have a chronic knee condition that has lasted for years- this device will help start the rebuilding process and help strengthen the surrounding and supporting tissues. Many of our past clients had suffered for years, then were completely amazed at the results they achieved after consistent, regular treatments. If you are still working with an injured knee, the T•Shellz Wrap® will help relax injured soft tissue prior to work and after a day at the job. 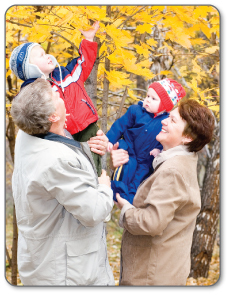 If you are still trying to enjoy your favorite activities such as gardening, walking, tennis, etc - use the T•Shellz Wrap® prior to activity to help reduce chances of re-injuring or re-aggravating those targeted tissues. If you are suffering from bursitis in your knee and want to treat the major source of it (secondary damage to the muscle and tendon surrounding the bursa sac). Through overuse or degenerative changes in the knee, the muscle and tendons surrounding the bursa sacs will tighten and constrict. When they do, they place pressure on the bursa, causing it to become irritated. Applying a soothing and deep penetrating energy to the knee relaxes the tissues and takes the pressure off the bursa. If you are experiencing atrophy in your knee and want to reduce the chance of re-injury - this is a perfect treatment to use on a regular basis. If you have had stem cell, PRP or prolotherapy treatments and your physician told you to get a radiant energy wrap, then this is exactly what you need. T•Shellz Wraps contain a unique Carbon Fiber Energy Pad which is flexible and will shape to conform to your body. This Energy Pad emits a uniform wave of perfectly safe electromagnetic energy over its entire surface. This energy travels deep inside to the soft tissue in your knee, stimulating the blood flow your own body needs to heal your injury. It is the electromagnetic energy that is crucial to the healing process. 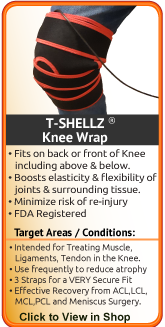 The Knee T•Shellz Wrap® was designed with flexibility and versatility in mind. We wanted to ensure that the Knee T•Shellz Wrap® can be placed on any area around the knee, including the back of the knee and sides of the knee. It is the optimal soft tissue injury knee wrap - highly versatile and capable of treatment a wide variety of ailments. increase the levels of oxygen within your blood. This, in turn, improves white blood cell function which increases the body's ability to eliminate toxins and other cellular waste by-products resulting from damaged tissue within the knee. This allows the knee to more easily stimulate the self healing process. which is a building block for human tissue. Many knee injuries are the result of trauma to a tendon or muscle, usually causing the tissue to tear. As a result of the tear, your body triggers a natural healing process resulting in pain, inflammation, and the creation of scar tissue. This process has 3 steps; getting rid of cellular waste while repairing damaged cells (inflammation), fixing the torn tissue with a "band-aid" solution (remodeling), and reinforcing that band-aid solution with flexible tissue (proliferation). You can speed your recovery while decreasing any risk of re-injuring the tissue by enhancing your body's own natural process of "tissue regeneration". Once inflammation has been reduced, scar tissue begins to form to repair the torn tissue. Scar tissue is much faster to build than flexible tissue, but it can only repair the torn tissue temporarily. Left untreated, the scar tissue provides little flexibility increasing the risk of re-injury. It will enhance the extensibility of damaged (& surrounding) tissue through a deep tissue thermal effect. This is a very important point. Many people with knee conditions often re-injure their knee due to the fact the damaged muscle or soft tissue is tight and the range of motion of the knee is restricted. Even the most minor of activities can cause a recovering knee to strain, sprain, or even tear. Every time this happens, your recovery is delayed. This is why using the T•Shellz Wrap® not only now, but also into the future, is wise. The energy emitted from the T•Shellz Wrap® is absorbed by the deep tissue, gently warming it, and thereby increasing the elasticity...all without risk of causing further harm and greatly reducing your chances of re-injury. Not only does it benefit those with soft tissue damage, it helps those who are dealing with nerve related issues. Electromagnetic energy, the technology the T•Shellz Wrap® is based on, has been shown to reduce pain sensation by direct action on nerves - slowing the velocity of pain signals that travel up and down the nerve. In addition, electromagnetic energy applied to muscles and soft tissue that surround the sciatic nerve will help them become more loose, alleviating the tightness which usually leads to nerve compression and the subsequent pain it produces. Greatly reduces stiffness in the knee joints. 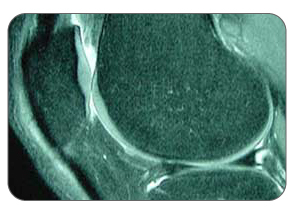 Osteoarthritis in the knee occurs when the articular cartilage begins to degenerate. Over time, the femur (upper leg bone) rubs against the tibia (lower leg bone) with little or no protection from the articular cartilage. This lead to pain in the knee joint. The space within the joint starts to decrease without the cushioning and stiffness in the knee becomes a problem. The T•Shellz Wrap® excels at emitting a soothing energy deep into the joint, allowing for less stiffness and better range-of-motion. Contributes to your overall well-being. Overall, you will get the benefits of a stronger immune system and a faster ability to heal muscle and soft tissue injuries such as sprains, strains, and tissue tears. Use the T•Shellz Wrap® before activity to prevent further injury, before bed to prevent tightness from setting in during the night, and again in the morning to make your tired body come alive. A Summary from Chapter 9 of "Therapeutic Heat and Cold", 4th edition. (amazon.com link) Ed. Justus F. Lehmann, M.D., Williams, and Wilkin. Tissues heated to 45 degrees Celsius and then stretched exhibit a nonelastic residual elongation of about 0.5 to 0.9 percent that persists after the stretch is removed. This does not occur in these same tissues when stretched at normal tissue temperatures. Therefore 20 stretching sessions can produce a 10 to 18 percentage increase in length of tissues heated and stretched. Stretching of tissue in the presence of heat would be especially valuable in working with ligaments, joint capsules, tendons, fascia, and synovium that have become scarred, thickened, or contracted. Such stretching at 45 degrees Celsius caused much less weakening in stretched tissues for a given elongation than a similar elongation produced at normal tissue temperatures. Experiments cited clearly showed low-force stretching could produce significant residual elongation when heat is applied together with stretching or range-of-motion exercises. This is safer than stretching tissues at normal tissue temperatures. Electromagnetic heat decreases joint stiffness. There was a 20 percent decrease in rheumatoid finger joint stiffness at 45 degrees Celsius (112 degrees Fahrenheit) as compared with 33 degrees Celsius (92 degrees Fahrenheit), which correlated perfectly to both subjective and objective observation of stiffness. Speculation has it that any stiffened joint and thickened connective tissues may respond in a similar fashion. Electromagnetic heat relieves muscle spasms. Muscle spasms have long been observed to be reduced through the use of heat, be they secondary to underlying skeletal, joint, or neuropathological conditions. This result is possibly produced by the combined effect of heat on both primary and secondary afferent nerves from spindle cells and from its effects on Golgi tendon organs. The results produced demonstrated their peak effect within the therapeutic temperature range obtainable with electromagnetic heat. Electromagnetic heat treatment leads to pain relief. Pain may be relieved via the reduction of attendant or secondary spasms. Pain is also at times related to ischemia (lack of blood supply) due to tension or spasm that can be improved by the hyperemia that heat-induced vasodilatation produces, thus breaking the feedback loop in which the ischemia leads to further spasm and then more pain. Heat has been shown to reduce pain sensation by direct action on both free-nerve endings in tissues and on peripheral nerves. In one dental study, repeated heat applications led finally to abolishment of the whole nerve response responsible for pain arising from dental pulp. Localized electromagnetic therapy using lamps tuned to the 2 to 25 micron waveband is used for the treatment and relief of pain by over 40 reputable Chinese medical institutes. Electromagnetic heat increases blood flow. Heating muscles produces an increased blood flow level similar to that seen during exercise. Temperature elevation also produces an increased blood flow and dilation directly in capillaries, arterioles, and venules, probably through direct action on their smooth muscles. The release of bradykinin, released as a consequence of sweat-gland activity, also produces increased blood flow and vasodilatation. Electromagnetic heat assists in resolution of inflammatory infiltrates, edema, and exudates. Increased peripheral circulation provides the transport needed to help evacuate edema, which can help inflammation, decrease pain, and help speed healing. Electromagnetic heat affects soft tissue injury. Electromagnetic healing is now becoming a leading edge care for soft tissue injuries to promote both relief in chronic or intractable "permanent" cases, and accelerated healing in newer injuries. The Knee T•Shellz Wrap®, is an FDA Registered Medical Device and is suitable for use in therapeutic clinics and FROM HOME. It is completely safe for people and patients to use for themselves. As mentioned earlier, the use of electromagnetic energy is becoming much more commonplace in North America for everyday people. The technology has been used for decades in the worlds of professional and amateur - a contributing factor as to why athletes seem to recover from injuries so quickly. Have you ever wondered by an athlete can return to activity after 3 or 4 weeks following a knee injury - while your average person takes much longer to return back to normal? The secret isn't really that much of a secret - it involves consistent treatments (meaning multiple times a day) using a diathermy treatment like the T•Shellz Wrap® to stimulate blood flow to the injured soft tissue. Most athletes have the luxury of using in-house therapy facilities many times per day. How many us can afford the time and money to visit a therapy clinic multiple times a day? Very few indeed. This is how you can gain the same advantage that athletes enjoy in healing their own injuries - by using a device like the Knee T•Shellz Wrap® two or three times a day on a consistent basis. 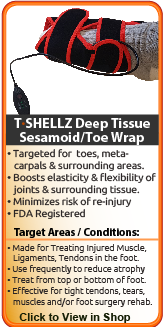 What Else Makes the Knee T•Shellz Wrap® So Special? We believe the T•Shellz Wrap® to be one of the most effective treatments to stimulate blood flow to dense, injured tissues such as muscles, tendons, ligaments, and other similar tissues. We can promise that you will receive a product that is designed to be safe and does what it is supposed to do...quickly relieve pain and aid in the recovery from tendon, muscle and other soft tissue injuries. The unit plugs into a standard wall outlet to get its power. The nice thing about the power supply is that the same unit can be used in North America and overseas as well. It has the capability to operate between 110v and 230v. It has a special signal controller that can be set for 3 different power levels of application (3=High, 2=Medium, 1=Low). The cord is long so you can sit or lie comfortably and watch TV, read or surf the net while you're using it. Treatments are max 30 minutes in duration and the device can be worn over clothing. This allows you to use the device at work, at home, or really anywhere you have access to an electrical outlet. 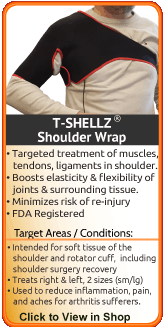 A Recap of the Benefits of the T•Shellz Wrap®.. When Should I Use My TShellz Wrap During the Day? The most common question we receive from individuals prior to purchasing is - how many times a day should I be using my knee wraps and when should I be using them? While treatment plans will differ for each individual and their specific injury, there are general guidelines that should be adhered to. Use a Cold Compress or Ice Pack when you are experiencing inflammation (usually after exertion or movement of the injury area). Before you know you will be using your injured joint (going to work, driving, typing, etc). Click HERE to Go To Our Online Store If you have questions, call our office at 1-866-237-9608 (toll free continental US). Dealing with aches and pains affecting the foot, ankle, leg, knee, hamstring, hip, back, arm, shoulder, elbow, wrist, or hand? If so, then applying the Arnica Infusion to any of these targeted areas will bring about fast relief from the pain and sore tissues. Simply apply a small amount of cream to the body and moments later, you will experience a soothing and comforting sensation over the area. Arnica Infusion is specially designed to relieve pain due to sore muscles and joints associated with arthritis, backaches, sprains, strains, and bruises. No matter if you are dealing with an acute injury, chronic pain, or a general "flare-up" - you will experience fast relief from pain and inflammation. This is a product that many of our current MendMeShop customers asked us to develop. So we focused our time and resources over the past few years and came up, with we believe, will be one of more effective, fast acting, topical pain relief creams on the market. You are likely familiar with some of the standard topical agents on the market as most of our customers use them. The are mass marketed and even found in most department stores now. Well, we are here to say that Arnica Infusion goes many steps beyond what they offer. Made in the USA at an FDA registered manufacturing facility, you can be assured that Arnica Infusion is both safe and effective. We only source top grade ingredients while implementing strict quality control checks during every step of the production process. 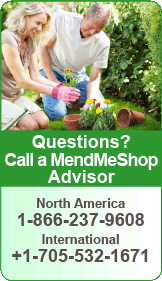 Expect the same high quality that MendMeShop customers have been accustomed to since we started the company in 2005. The "Cool Blue" formula is the perfect balance between the smooth application of a cream and the effective absorbing factor of a gel. It is not too thick and not too thin - just the right texture. Best of all, it feels very nice on the skin! Each application of Arnica Infusion feels so comforting and soothing, we are certain it will become an item you will not want to live without. The Arnica Infusion formula is based on a combination of scientific research and the use of high quality ingredients. The properties within the formula were chosen for their pain relief, anti-inflammatory, and soothing qualities. The acting ingredients within the formula include ones many of us are familiar with; along with ones that have not received a lot of publicity (only in research circles). Extensive testing resulted in a blending of ingredients that provides the most synergistic of benefits. Extensive quality control procedures during the manufacturing process ensure the ingredients and final product are both safe and effective. We would not stake our reputation on anything but the best. When Do I Apply the Arnica Infusion? Apply Arnica Infusion at work to help reduce acute discomfort associated with overuse of muscles and joints. No matter if you are in a physical demanding job or work within an office environment, you will be placing stress on different parts of the body and aches and pains will result. If you suffer from a sprained ligament, pulled muscle, strained tendon, or even bruising - apply Arnica Infusion for quick relief of the pain. Application of Arnica Infusion can be done up to a maximum of 4 times per day on a consistent basis to help bring about relief from various pains and aches. Follow up your T•Shellz and cold therapy treatments with an application of Arnica Infusion. Combine the pain relieving benefits of Arnica Infusion along with the healing benefits of the wraps to make your recovery go much more smoothly. Do not apply Arnica Infusion within a 2 hour timespan before a T•Shellz Wrap® treatment. Whether you decide to use the Arnica Infusion in conjunction with the T-Shell and other treatments - or if you decide to use the cream as a stand-alone product - you will not be disappointed with the results. We guarantee it. Since you are reading this, you probably know that serious knee injuries do not just disappear. Over time, it will wreak havoc on your knees, hips, ankles and lower back due to lack of movement, over-compensation and a change in gait. It will also wreak havoc on your opposite knee, due to overuse of the "good knee". Recovery takes a longer time for such chronic (long term) injuries, but proper healing is essential to regain strength and get you back to the activities you enjoy. The longer your injury endures, the greater the risk of running into serious overcompensation injuries and a permanent change in gait. Everything in the human body is connected. Patellar bursitis can lead to other injuries over time if not treated properly. For example, the knee of your opposite leg may start hurting due to increased strain on it while you are trying to walk. On-going pain in this area could potentially result in long term (chronic) knee pain. Over time you may also change the way that you walk when your knee is hurting. If you change the way that you walk, how you get in and out of a car or even the way you climb a flight of stairs you will most likely irritate your lower back and hips. Usually a knee injury will happen on the dominant side (if you are right handed, this would be your right knee). When this happens there is a higher risk that you will over-strain your weaker side that is compensating for your injury. On-going injury, chronic conditions and over compensation pain are all reasons why it is important that you remain proactive in your recovery. This is why it's also critical to completely heal your knee before returning to activity. If you don't focus on healing your injury quickly and completely you run the risk of interrupting your lifestyle in a major way. 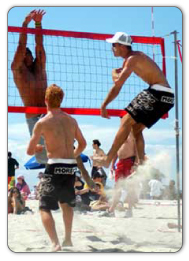 To Stop Re-Injury & Reduce the Risk of a More Serious Overcompensation Injury, You Need to Heal Quickly & Completely! A Cold Compress or Ice Pack to reduce inflammation of the bursitis (and likely tendinitis) as soon as possible. A Deep Tissue Therapeutic Knee T•Shellz Wrap® to increase blood-flow to the injured knee (Deep Tissue Therapy Therapy). 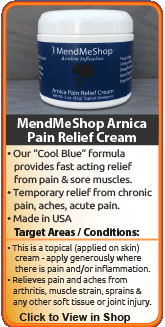 MendMeShop Arnica Pain Cream for temporary relief of pain due to sore muscles and joints. An Exercise & Stretching Plan to prevent muscle atrophy and shortened tendons. A proper plan will increase elasticity and strengthen the muscles, tendons and ligaments of the knee. Conservative treatment tools just like these have been used successfully by thousands of knee injury sufferers - just like you. We believe the use of T•Shellz Wraps for effective treatment of soft tissue knee injuries is one of the most under-utilized home treatment options available on the market today. We have thousands of customers that have tried many options out there and have been amazed at how effective and fast the TShellz Wrap treatment can heal soft tissue injuries. Your pain will be reduced. The applied deep heat will increase blood flow. This increased blood flow will stimulate your body's healing response, helping you recovery from soft tissue injury more quickly, at a reduced risk of re-injury. Doctors and Surgeons are always improving the techniques used in surgery, and results from surgery now are much more positive than they were in the past. However, all surgeries introduce scar tissue, and recovery from knee surgery is better than ever but often disappointing when it comes to full recovery expectations. If you do wind up getting surgery, know that rehabilitation at-home while attending regular physical therapy or doctor appointments is vital for your overall recovery. Consistent exercise and conservative treatment on a daily basis during your rehabilitation while working with your doctor or physical therapist is key. This is why you should seriously consider maximizing your recovery by using the T•Shellz Wrap® at home once you are approved for physical therapy. The more consistent you work at enhancing blood flow to surgically repaired soft tissue, the more consistent the healing process will be. Nourishing soft tissue with increased blood flow will bring more oxygen and nutrients (which are carried through the blood stream), giving the body a better ability to produce new, healthy collagen. In effect, you will help the body produce stronger tissues while potentially reducing the number of setbacks that can occur following surgical procedures. We all know that if the injury was healed, the pain would go away but what about the opposite situation? If the pain is gone, does that mean the injury is better? Unfortunately, this is not always true. Too many people only focus on suppressing pain symptoms while providing less attention to the true healing aspects of the body. Experiencing less pain, while obviously a good short-term goal, never equates to underlying healing. Scar tissue can remain for months after one gets to a point of being relatively pain-free. However, as long the weak and brittle scar tissue remains, you are susceptible to re-injury or re-aggravation. Certain motions or movements can cause the weaker tissue to easily tear - resulting in some reversal of the recovery up until that point. This is why we recommend for people to continue with their doctor or therapist recommended exercises and to continue with mild treatments of the T•Shellz Wrap® for a period of time - to better ensure complete healing. Ongoing treatments to enhance circulation will soothe, relax and promote healing of your damaged knee muscles and tendons. Knee T•Shellz treatments will also allow your soft tissue to extend further due to the deep warming sensation created by the enhanced circulation to the treatment area. The more extensible your tissues are, the less likely they are to strain or sprain. The Knee T•Shellz Wrap® is a highly effective therapy tool for people suffering from bursitis or other soft tissue knee injuries - such as a tear in your muscle, tendon or other soft tissue, strain, Tendonitis, tendinopathy, tendinosis, impingements, instability, knee spasms, bursitis, capsulitis, pain associated with trigger points, scar tissue, and arthritis. A huge number of people who contact us about knee pain are unsure about the true causes of their discomfort. It is an amazing statistic and really goes to show how important it is to get a proper diagnosis from your physician. To really deal with a injury, you have to know the injury is - so get to the doctor and find out. People tell us all the time, "I was told that if I stay off my feet for a few weeks, my knee pain will disappear for good." The truth is, knee pain is usually a culmination of numerous factors, which often include repetitive stress, high load issues due to excess weight, and/or overcompensation issues resulting from other muscle and soft tissue ailments. It may take weeks or months for these knee pain triggers to surface, but when they do, merely resting will not solve the underlying issues. You need to utilize options that actually treat the source of the pain and help reverse the damage that has been done. Resting has a role to play, but it is only one small factor in a recovery plan. From Customers Who Simply Want To Thank Us For Introducing Them To Our Amazing Products! Let me tell you, we appreciate all the feedback we have received over the years. We have had many medical professionals, athletes and everyday people call and write to tell us about their positive experiences with our devices and the company in general. It never gets old hearing about the successes and it provides us with the motivation to continue doing what we do best - provide individuals with options to heal from the comfort of their own home. The Best Service by Far! 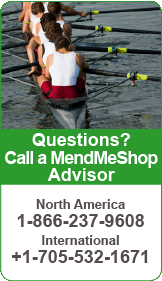 The service from the Mend Me Shop is by far the best you could ever hope for. I have spoken to Paul on numerous occasions and his knowledge is very much appreciated. Do not hesitate to order from this company. Their products are made well and work. Their customer service is the best you could ever hope for. I have called the office and received helpful guidance. Really appreciate the help and so glad I found your products! I really appreciate y'all emailing and responding. I'm in business myself so I know the importance of customer service. Your company has done a superb job and it's really appreciated. I know it takes a lot of time but it's very well worth the time you spend. Thank you, too, for the personal attention to your customers. A rarity, in today's world! You guys are tremendous. I was overwhelmed by your speed and thoroughness regarding my problem. Thanks again for your wonderful products and support. The fact that you guys are there for us every step of the way matters as well. Your company is wonderful and that's a rarity these days. The cost seemed minimal compared to what I had already spent at the doctor and physical therapist. Thank You so much superior service as well as unprecedented guarantee. If you're tired of being told that resting, drugs and surgery are the only answers to your knee injury.... Be optimistic, because there are effective alternatives for you. The Reasons For Our High Success Rate - Our Customers! We will never claim our products will work for everyone. That is simply impossible to achieve. Everyone has a different capacity for healing and different circumstances behind their injuries and/or conditions. In addition, some people may have a hard time sticking with recommended protocol in order to achieve benefits from our devices. Quite simply, our clients that have had successful outcomes have made a small effort to invest 60 minutes a day into the program. If you do the same, chances are you will be very happy with the outcome. We have helped thousands of clients since 2006 and during this time, our refund rate has held steady at an astonishingly low 6%. That means that for every 100 people who try our products, 94 of these individuals are happy with the results these products provide. Odds are certainly in your favor that you too will achieve a happy outcome. This fact alone speaks volumes to the effectiveness of our solutions and with a full 60 day money back guarantee on our wraps, there really is no risk in trying. Right after you place an order, email us and we will have a plan developed immediately so you will be able to get started upon arrival of your parcel. We can't promise you miraculous results, however, we do promise to do everything we can to help you with your condition. You are never alone when making a purchase from us. When we say we stand behind our products, we truly mean it! If any question or concern arises, simply send us an email at any time (we check our emails constantly all throughout the day and night - even on holidays!). We will respond as soon as possible. 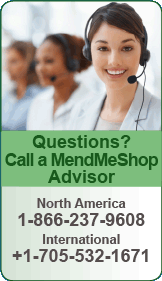 Simply call toll free 1-866-237-9608 to place an order with one of our knowledgeable Product Advisers. They have the ability to answer all your questions...ensuring you only receive the products you need. Everything you have read up to now has hopefully given you some hope. It may seem hard to believe, but our Knee T•Shellz Wrap® home therapy products will assist you in recovering from goosefoot bursitis by maximizing blood flow where it's needed most and reducing your swelling and inflammation induced pain. Here at AidMyBursa we pride ourselves in helping you with your healing and recovery process. Everyone at AidMyBursa has tested and used the products, finding solutions to conditions that do not fit into the norm. However, words are meaningless unless a company stands strongly behind the products they sell. This is what sets us apart from others...we offer people a comprehensive, 60 day, full 100% money back guarantee. We take on all of the risk because we know our products work well for the overwhelming majority of people who purchase them. Guarantee #1 - Use your products diligently for up to 60 days and you will experience a significant reduction in pain. If not, we encourage you to send back the items for a 100% refund. 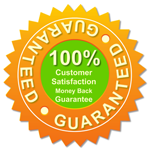 Guarantee #2 - You will not be left in the dark after purchasing any product form us. AidMyBursa Advisers and Product Specialists are available Mon - Fri by toll free phone 1.866.237.9608 or email to answer your questions or concerns. Guarantee #3 - Your order is guaranteed to be shipped within 24 hours on every business day. Guarantee #4 - All purchases receive a one year, full replacement warranty with guaranteed, prompt service. Guarantee #5 - You could save hundreds of dollars and possibly more, by utilizing our products, and getting back to work sooner. Guarantee #6 - Everything you read on this site is true. Unlike us, companies not registered by the FDA can state anything they want about their products. Because we are FDA registered, you can rest assured that these products do exactly what we say they do. Continue the healing process by resting your knee. Limit the activities that may aggravate your knee. Without proper rest and limitation on activities, being active as if your knee is healthy can lead to re-injury. To get back to doing the things you love, you need to give your body proper care and attention. If you want to avoid re-injury, manage pain and increase circulation for lifelong health benefits, a Cold Compress or Ice Pack and a Knee T•Shellz Wrap® will provide the results you are looking for. Why spend time in pain, off from work, and missing out on your active lifestyle when you can be proactive about your injury and the health of your body? 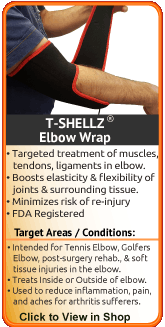 Talk to your doctor about incorporating a T•Shellz Wrap® into your home recovery regimen. We will never claim our products will work for everyone. That is simply impossible to achieve. Everyone has a different capacity for healing and different circumstances behind their pain and discomfort. But what I can say is this...we have helped tens of thousands of patients in the past six years. During this time, our refund rate has held steady at an astonishingly low 6%. That means that for every 100 people who try our products, 94 of these individuals should be experiencing moderate to significant relief. The odds are certainly in your favor that you too will achieve relief from much of the pain and inflammation that is currently burdening your lifestyle. This fact alone speaks volumes to the effectiveness of our solutions. Right after you place an order, call or email us and we will have a plan developed immediately so you will be able to get started upon arrival of your parcel. We can't promise you miraculous results, however, we do promise to do everything we can to help you with your condition. Word is spreading and as a result, our sales are increasing. With this increase, we can achieve economies of scale...meaning we receive the best component pricing because our volume is high. We keep our overhead costs low by selling only on-line versus setting up costly distribution channels offline. Think about it – you can now have the ability to treat your pain from the comfort of your own home while saving money in the process. Best of all, you are fully protected when making a purchase from us as we offer a no-hassle 60 day, full money back guarantee. Living with pain is never easy as it affects your entire lifestyle. Nothing is more important than making the proper decision when it comes to treating your muscle injury. Most methods only mask the problems or provide temporary relief; they do not treat the pain at its source. AidMyBursa stands out in this regard as our goal is to help you heal for the longer-term. The bottom line is, you are welcome to try our products for a full 2 months. If you use our product as directed and do not receive the benefits that others have experienced, simply return your purchase back to us and we will issue a prompt & full refund. There will be no hassle and no hard feelings. The fastest option you have to get our product into your hands as soon as possible is by placing your order online - at this very moment..
Place your order on-line through our ultra-secure website by clicking the image below. Or, Call Our Office. We are open Monday to Friday to allow you place an order over the phone. 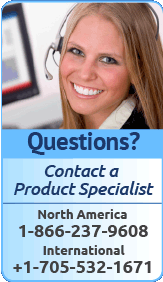 Simply call toll free 1-866-237-9608 to place an order with one of our knowledgeable Product Advisors. They have the ability to answer all your questions...ensuring you only receive the products you need. If you choose to order through our online shop, know that we keep no credit card data on file. Once the transaction is completed, the credit information disappears from our internal systems. As you can see, ordering from us is a very easy and safe process, no matter if choosing to order on-line or over the phone. What is the success rate of the Knee T•Shellz Wraps? Do they really work? 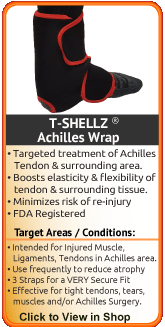 The short answer is - yes, the T•Shellz Wraps are very effective at healing muscle and soft tissue injuries. We try and keep in touch with a large percentage of our customers, and we encourage them to do the same. In doing so, we have received a lot of feedback as we have sold Electromagnetic Devices since 2008. We can say that the return rate on our products is only around 5% any given month. That is exceptional by anyone's standards. Therefore, we can safely indicate that the overwhelming majority of people who purchase from us do achieve benefits with our products. What is the difference between the T•Shellz Wrap® and a standard heating pad? The differences between the T•Shellz Wrap® and heating pads, moist gel packs, etc - is a night and day comparison. There is nothing that compares to the healing capacity of the T•Shellz technology. To begin with, heating pads and the like work on conduction. The heat has to be forced through multiple layers of skin and fatty tissues. With each layer of skin the heat passes through, there is a corresponding energy loss because that heat is absorbing into each layer it passes through. By the time the heat reaches the targeted area, very little energy is remaining and this does not effectively enhance blood flow. Without the enhanced blood flow effect to the injured tissues - healing just won't happen. The heating pad may feel good when on the body, but that is because you are merely heating the skin. Moist heat has been believed to be more effective at warming internal tissues versus dry heat, because it is believed that water transfers heat more quickly than through air. Clinical studies do not support the popular belief. In comparison... The T•Shellz Wrap® is based on the scientifically validated principle of Electromagnetic energy. This form of treatment is safe and effective as shown in numerous studies which can be referenced through the National Library of Medicine. The energy from the T•Shellz Wrap® ultimately will gently warm deep tissue, improve blood circulation, and boost metabolism and enzyme activity. This is why it works so well - because the body responds very well to this form energy. In stimulating blood flow to the damaged tissue, you provide the tissue with the oxygen, nutrients, and antibodies it needs to regenerate new, healthy collagen. In addition, you will experience a clearing of toxins and excess fluid build up from the injury site. Over the intermediate term, this helps to reduce incidents of swelling as trapped fluids will be whisked away - reducing pressure on vessels. How much time do I need to dedicate for treatments? Are the products easy to use? 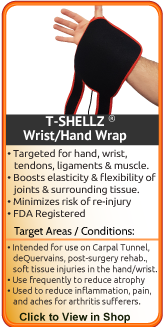 The T•Shellz Wraps are very easy devices to use. After one or two uses, you will engage in the treatments with ease. Very detailed instructions are included and you are always welcome to contact us by phone or email if the need for help arises. For the T•Shellz Wrap®, it is ideal to use the device two or three times a day on average. Each treatment session is a maximum of 20 minutes in duration and the device will turn off automatically at that time. Typically, people use the T•Shellz Wrap® before bed, upon awakening (or not long after) and one other time during the day when the opportunity presents itself. For people in an office setting, many will use the device at work (as it can be worn over clothing). For others, they will use the device an our or two after work. A Cold Compress or Ice Pack is primarily used following activity that stresses the injured tissues (following work, after a sports activity, or just suffering a general re-injury). This is done to reduce inflammation and to minimize tissue damage. Treatments are 15 to 20 minutes in duration. We established our firm in December of 2005. Our track record in this field continues to grow and we plan on being around for many decades to come. What is your return policy? Is it the standard 30 days? We go above and beyond what other companies offer - we offer a full 60 day money back guarantee with no restocking fees. AidMyBursa advisors do not work on commission, so be assured you will only receive fair and objective information.